Brigham Young High School was unique, it was said in the 1960s, because it was a "laboratory school" where experiments in education were executed -- and we do not use that verb lightly. BY High administrators and teachers, in an effort to demonstrate the continuing uniqueness of the school, sought aggressively to invent new "cutting edge" ideas for secondary educational theory and practice. Perhaps it was "publish or perish" for them. But along the way, they, like Edison, discovered a number of ideas that did not always work as anticipated. One such experiment involved rewriting certain key parts of our high school curriculum so that students could, without attending group classes, progress (or regress) at their own pace. In some subjects, we continued to enjoy traditional classes. Fast students -- we had a modest number -- could speed along reading and completing several years of work in one, and conversely, slower students could march along to the beat of their own drummers. For example, under this system, it took one student* three years to complete his Algebra I. Even then, he had to mail in his final lessons by enrolling in a BYU home-study course and purchasing two three-month extensions. When asked to describe his ideal of higher education, President James A. Garfield described it as Williams College President Mark Hopkins sitting on one end of a log with his student sitting on the other end. The goal of this BYH experiment in secondary education was to eliminate the live teacher, as much as possible, from one end of the log. Of course, without the need for teachers, students might have tested this system within the walls of their own homes, in a library, sitting in an unused classroom, or lounging under a tree on the lawn, as part of their regular homework, but holding no classes left an obvious gap in our daytime school schedules -- and a gap in the need to employ teachers. Therefore, the designers of the experiment decided that students should do their self-paced study during their now-empty class periods. Teachers and teacher trainees would stand by, invisible except when students could not understand a written concept, and then they could be paged to appear magically from behind a screen. Our school was frequently visited by groups of teachers and administrators from other high schools around the country also searching for avant-garde ideas. As a result, this venture had to be kept visible and appear organized -- in short, to be a "tourable experiment". Needed: A "Tourable Study Area"
Our experimenters all agreed they needed a "tourable study area". To them, of course, mixing us together in one large room would be a disaster, somewhat like our old-fashioned classes where we visited and joked and laughed while we worked to learn together. No, they sought a more concentrated system of individual isolation study sites -- optimally small soundproof rooms with adjustable climate controls, toilet facilities, piped in classical music of their teachers' choice, hot and cold running water, vending machines stocked with apples, carrots and milk, one-way windows looking only "in" so students could be observed at all times, and locks on the doors. After many compromises in the concept, a much simplified system of "carrels" was adopted -- small bare plywood desks with panels between them that came up to a height of about 4 feet. Like Abe Lincoln's childhood home, these stalls were closed in on only three sides, leaving one side open for ingress, egress and hopefully, progress. This then, was the BYH student's end of the truncated education log. 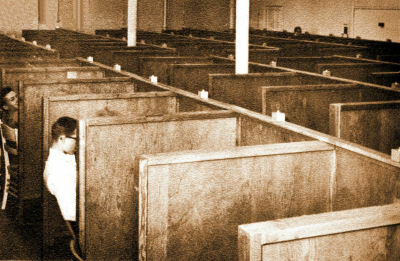 In subsequent decades, American business adopted the same concept wholesale, and the carrels became known as "cubicles" -- BYH lacked only the ubiquitous cheap computer stations of future decades. Where could these study stations be located? Room 250A on the second floor of the Arts Building had been a large multi-purpose social area used to hold dances, eat lunches, watch movies, combine classes, etc. As the BYU art and music departments vacated more and more classrooms on the Lower Campus while moving to the Upper Campus, administrators saw 250A as the best place to build more than one hundred isolation carrels. The carrels were so small, there was still plenty of room left over for small classrooms, offices and storage rooms on the second floor. When the carrels were first installed, students who needed help either raised a hand, or stood up, or both. However, when students sought to catch the attention of a roving teacher, they also caught the attention of their friends in nearby carrels, who welcomed any excuse to interrupt their enforced concentration. The designers of this experiment sought to reduce this type of disruption by creating a "red flag" system, perhaps inspired by flags on mailboxes. Carpenters made a flag for each carrel, consisting of a small piece of masonite painted red, standing in a slot cut into a small wooden base. Students seeking a teacher's help simply placed their flag on the top surface of their carrel. The initial system was primitive, cheap, and would have been effective, but the flags began to break and disappear, and so had to be repaired or replaced frequently. And when students felt their flags were being ignored, they began to toss them up and down in the air. When they got really frustrated, they threw them down an aisle or against a wall. The greatest lagtimes in providing help came, of course, when teachers were diverted to give tours of the experiment. The makeshift flag system drew frequent laughter from touring visitors when they saw the flags bouncing in the air, or skittering along on the floor under the carrels. Someone decided that this rather bland educational experiment would look jazzier if each carrel had a permanent electrical signal system -- flashing like Christmas lights! Surely this would dazzle the "academic tourists" from other schools, and solve the shortcomings of the old flag system. Electricians were called in to design and install a three-way electrical switch on the desk of each carrel. Then on top of each carrel they installed a small metal box (see photos). Each box was topped with a small orange dome light. Now when students needed help, they flipped their switch, which caused the light in that carrel to blink, also triggering a corresponding light to blink on a master panel -- think flight attendant call lights. When the teacher arrived at the carrel, they flipped the switch so the light would glow without blinking, and when they were finished, they turned the signal light completely off. No, in that pre-computer age the duration of each step was not recorded to measure efficiency -- wouldn't they have loved to have that capability! More research papers! The large yellow master panel was installed on the wall over a large desk in the front of the room. It featured a numbered light for each carrel, and was cut in the "L" shaped configuration of the carrel hall. The signal system required one large 8" high vacuum tube, which closed the circuit and also controlled the blinking feature. Without this tube, all circuits would be broken and the help request system would be sent back to the stone age -- or flag age. In hindsight, the designer of the master panel could have hidden the tube inside the panel, but chose instead to let the tube sit on top of the panel, a glowing symbol of "tourable" high technology in 1962. The Mysterious Disappearance of the "Tube"
After several months of more or less successful use, one day the new signal system suddenly stopped functioning, and for a while no one could figure out why. 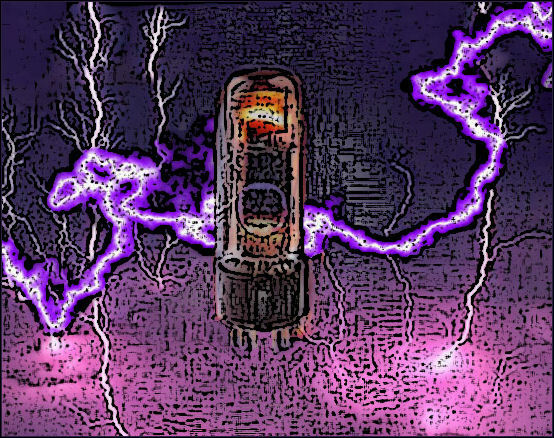 Then someone happened to notice that the large vacuum tube was missing from its position of glory atop the banana-coloured master panel. Did someone remove it to polish it? Replace it? Or steal it? -- that had to be it. Immediately the teachers called for the guilty "picksocket" to return it. With each passing day, their demands and threats grew in intensity. However, no one confessed, and the fate of the "Tube" came to be seen as a flagrant challenge to the disciplinary stability of the school. Angry Principal H. David Nelson (that was actually his full title) turned it into a "federal case" by scheduling an emergency student body assembly, where administrators, faculty and student leaders demanded that everyone help in returning the all-important "Tube" to its rightful place. Our 1962-1963 BY High basketball team had been winning at a record pace under our new coach, Courtney Leishman. Principal Nelson announced that the basketball team would forfeit every game from that day forward until the "Tube" was returned. Coach Leishman's face turned pale at the prospect of losing his winning season, thus placing his new job on the line. The face of every basketball player turned red with anger. They did not want to be made the scapegoats for one or two unknown mischief makers. Our highly respected elected student leaders stood up and spoke out. Francis Rogers, president of the student body, made a strong appeal for honesty. Then George T. Taylor, first vice president, made a speech memorable for both its frustrated passion and erudition. After the assembly, John Boshard, one of BY High's resident student philosophers, voiced his high admiration for Taylor's remarks. "Any student leader at any other school," he said, "would have called the vandals 'crazy' or 'nuts' or 'insane' -- but at this school, George Taylor says the perpetrators are 'demented malcontents' -- that is just one more indication of what a classy school this is." Angry Principal H. David Nelson canceled the Yearbook Assembly as punishment. It was never presented, even though the cancellation came just days before it was scheduled. This highly rehearsed assembly was always one of the most entertaining events of the year. As a side note, many of those who have reviewed all BY High yearbooks have said that the 1963 Wildcat yearbook, with Ruth Halliday as the overall publication editor, and A. Lamoyne Garside and Sharon Stoddard as faculty advisors, is the best yearbook that BYH ever produced, in a field with many truly outstanding yearbooks. Someone -- perhaps Jeff Sorensen -- ceremoniously brought in a large box containing an admirable collection of vacuum tubes and presented it to the administration as a conciliatory gesture, but this peace offering was summarily rejected. While the Yearbook Assembly was canceled, no basketball games were forfeited or called off, and the outstanding 1962-1963 team went on to win the State Class B Championship, one of a number of championships achieved by BYH basketball teams under the tutelage of Coach Leishman. The "Tube" was never returned, but was eventually replaced by a new one ordered from a vaccum tube factory in a land far away. The guilty student or students remained uncaught, and the rumor mill never came up with their identity. Most important to us, nobody disappeared one night from the school, never to return. To this day the fate of the tube and the tube-taker remains shrouded in the mists of time, like the disappearances of Judge Crater or Amelia Earhart or Jimmy Hoffa. Inquiring students were told to "forget it and get back to work" and we did, lest we be suspected of being involved. The incident was not mentioned in any way in the Y'ld Cat newspaper or in the 1963 Wildcat yearbook. But like every good mystery, the haunting tale of the The Missing Tubus Vacuumus of BY High stubbornly refuses to die. Do you know whodunnit? Please don't tell us -- we prefer the never-ending mystery! What if BYH experiments had continued?